Country Wide Steel Frame Erectors build all types of steel buildings, including kit homes, sheds, barns and stables and employ a team of fully licensed and highly experienced builders who can ensure that new steel buildings will be built exactly the way they were designed, without a fuss, and on budget. Country Wide Steel Frame Erectors design and build horse stables of any size to suit their customers' needs. These steel horse stables are functional, attractive and strong and will be admired by any horse owner and loved by any horse. By using heavy gauge steel, hot dipped galvanised steel, and strong timber inserts, Country Wide Steel Frame Erectors ensure their steel horse stables have a long life and require very littel maintenance. All hinges and door locks are heavy duty, and designed with customer and horse safety in mind. 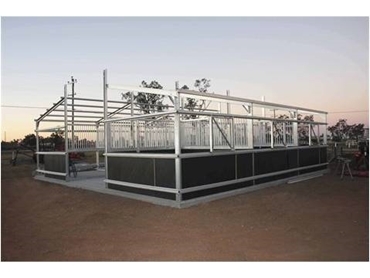 Country Wide Steel Frame Erectors also custom design and build each steel horse stable to ensure it is 100% suitable for the owners requirements and comes at the right, competitive price.